Staunton, Virginia Located in the historic district of downtown Staunton, Virginia in the beautiful, celebrated, and old, Stonewall Jackson Elementary School building, the IagoArts Studio gives every person an opportunity to create and relax, regardless of your artistic skill level. The Studio serves a three- fold purpose: First, to give the public a chance to create, offering Art Classes and Art Parties. Secondly, to be a working studio for fine artist Donna Cruce Kocka, and to serve as her Gallery for showing and selling her artwork. And finally, the studio serves as a place for Art Classes for the community. Mostly for children's classes. Mrs. Kocka has been teaching for over thirty years and loves working with both adults and children. Along with teaching, she is a muralist, portrait painter, set designer, and loves plein aire painter. She and her husband opened this studio in order to expand the opportunities for local art lovers to play and learn together. She is a firm believer in learning to become 'whole brained' and loves the prospects of strengthening that cerebral cortex. Let's do some Art to become a healthier community. Come and join us- You really were created to create! Spring is a schprunging! My dad used to say that... I always thought it was funny. I still do. But boy do I love spring! NOW is the time to schedule that birthday party you have always wanted! Things are a changin' around the studio these days. Due to some unexpected life-demand IagoArts will no longer be having regular public paint Parties. BUT, we will schedule YOU a private paint party. It's easy. And you can pick the date and the painting for your party. Just contact me and let me know a date range and painting idea you are interested in. Mountains, flowers, birds, animals, whimsy? Call now! We are now booking Private Paint Parties into February! I would love to make your very own Paint Party with your friends happen! Only a four person minimum. Paint Party! It's time to schedule yours! ​At IagoArts you can come to our lovely studio, located in the middle of Historic Staunton's downtown, bring your own food and drinks, listen to some music while your are given everything you need to make a masterpiece. We provide everything from the aprons down to the canvas and brushes. At IagoArts we will walk you through any number of options from start to finish and in a couple of hours you will be able to display your work on the wall at home. To come to an IagoArts ArtParty you can schedule a Paint Party with friends, by yourself or as a date for two, as a team building party for your office complete with complementary canvases. Contact me to beging the conversation. We will pick out a date that works for you all and then find the perfect painting for you to do. We will check out the calendar to schedule a date nights and then sign you up. The paint events vary in cost from $25 to $65 per person depending on the size of the canvas, the size of the party and difficulty of the painting. For a special event, such as a birthday party or just a girls night out you can schedule an ArtParty! You may contact Donna to make arrangement for a smaller party, or schedule as many as 10 in her studio for a group event. The Group ArtParty events are $300 for up to 10. For over 10 people contact me for pricing. We have other venues but we will have to discuss what your are looking for. Do you want to remember that sweet little furry friend? She specializes in Pet Portrait Parties. Woof! It's easy- each of your party attendees will email the photos to the studio and when you come to paint your dear furry ones your will already find a helpful drawing on the canvas waiting on you. It's sort of like a paint by number. Just email us to let us know what type of Paint Party you want and IagoArts will make it happen! ​Day classes are ideal for children, ages 8 through middle school, who are being homeschooled or student's who are home bound. They classes meet regularly on Tuesdays throughout the school year, beginning in the Fall, after Labor Day and ending the middle of May. Every year there are no classes between Thanksgiving and New Years Day. Mrs. Kocka teaches her Art Classes with a four year rotation so that no class or activity is repeated for four years. This enables students to stay with her classes throughout their homeschooling years continually learning new and exciting skills and working with as many different media as possible. Each class begins with a short five minute presentation of Art History. Every year the history follows a timeline beginning in the Fall with Prehistoric Art and moving toward Modern Art in the Spring. Each year begins with a review of drawing skills then moves into a plethora of medium; this can include watercolor, acrylic, pastels and usually some form of sculpture to reinforce their lessons. Each class for that year will focus on one or two of the 7 Elements of Art- Color, Line, Space, Form, Texture, Value and Space- reinforced throughout that year. Classes for High School students who are interested in exploring the possibility of pursuing Art after high school are offered as the High School Portfolio classes. These classes are after school hours so students from any school setting can participate. Finally, each Spring we end the year with a beautiful Annual Student Art Show, complete with each student's work shown in a professional style, and the 'all important' punch and cookies to share with family and friends. ​Go to our Contact Page and ask how you can get your children involved. Because I love teaching SO much, paint parties, children's classes, adult art classes, I sometime forget to tell people that I am first and foremost, an artist. I've been drawing and painting as long as I can remember. I have a BFA (that's an Art degree, :) from the University of Tennessee (that's why I can say, 'Ya'll' so well) and could never get enough time to just create! Please check out my artwork that is for sale on the D. Cruce Kocka Art page. Everything you see, (that isn't marked 'SOLD') is available for you to buy right now and hang in your beautiful home! Nearly everything I do is LOCAL: people, scenery, pet portraits, etc. So my work is all VERY Staunton, VA. Mostly because I love it here ​If you see something and are not sure if you want to buy it without seeing it in person, let me know. I will gladly meet you at the studio so you can browse my paintings! Born and raised in a southern family, Donna has been drawing since she could hold a pencil. Donna Cruce Koćka, BFA, University of Tennessee (1986), has been a longtime Staunton, VA resident. She is married and has three children, one beautiful grandson and two labs named Leighla and Mazi, and a very fat cat named Alan (who posed for the painting, 'Happy'). Currently she is enjoying teaching homeschoolers Art during the school year in her Monday and Tuesday classes at her studio. She also loves working with the public getting their hands into paint with her Paint Parties and other volunteer opportunities. When she is not teaching or painting, she leads group bible studies and teaches other Art classes in Staunton. She also loves to hike in the beautiful Blue Ridge Mountains, read, walk in the park with her dogs, travel to Europe and Africa and especially she loves to have tea with friends. Donna began teaching Art for children during her Senior year at the University of Tennessee. And along the way, as she was raising their three children, she was painting portraits, murals, theater set design and construction, faux finishes and also doing a little graphic design. In 2011 she took a landmark oil painting class with Cedric Egeli, an internationally known colorist and portrait artist on Cape Cod. This outdoor portrait class began a new journey for her. She is fascinated with the effects of light and color and has since studied on the Cape again with Camille Prezwodek and at Maryland Hall with John Ebersberger. At the local Beverley Street Studio School she has taken classes with Elise Blake, Jeffery Stockberger and numerous classes with the renowned colorist, Ron Boehmer. Boehmer is recognized as one of the nations foremost landscape and plein-air painters and has had a heavy influence on Koćka’s painting. 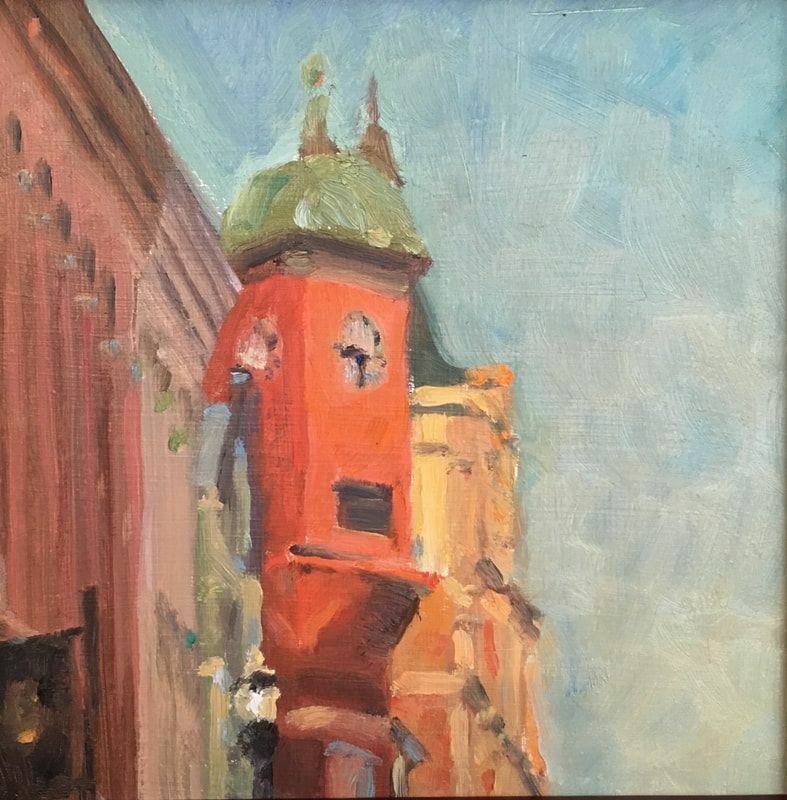 In the Spring of 2018 she was one of the Artists represented at the Queen City Plein Air Festival. ​Her love for painting plein-air painting often draws her outdoors to the beautiful Virginia countryside or to historic downtown Staunton. 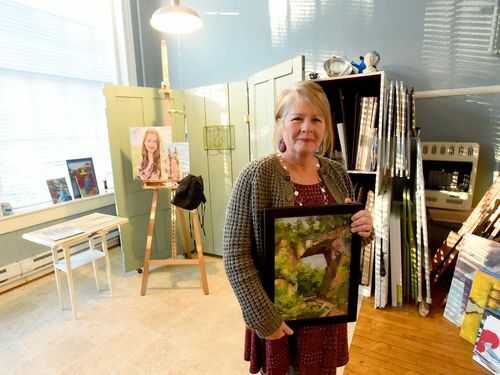 She also spends time at her studio and gallery, IagoArts, in downtown Staunton. Donna is currently painting outdoor children’s portraits, landscapes and murals and is available for commission art work. Look for her Upcoming Paint Parties at IagoArts to get a chance to play and create art with her or just come by the studio for a visit. 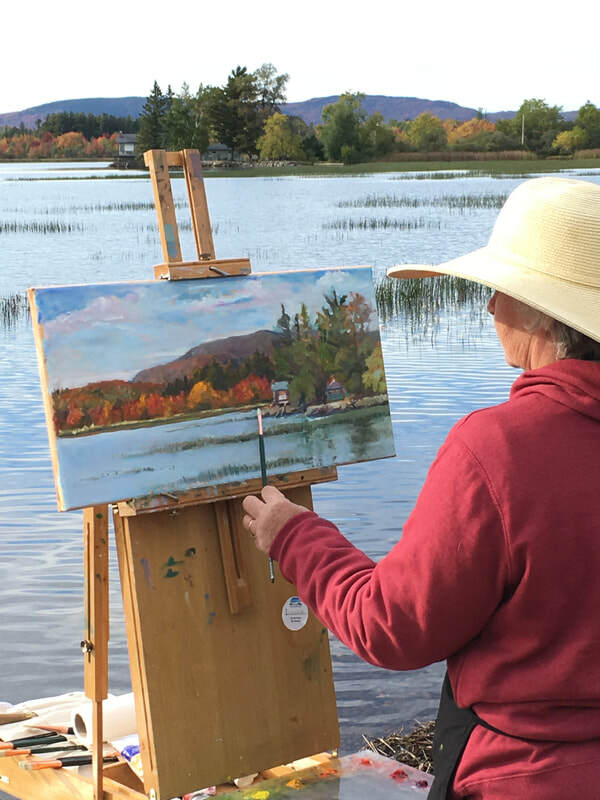 Photo to the left: Plein Air Painting October, 2018 in the Adirondack. OOh the Fall colors!